Junction Point—the development studio founded by legendary game designer Warren Spector and later acquired by Disney—made 2010's Epic Mickey all by themselves. That technologically ambitious and mostly pretty game came out exclusively on the Wii. But, now that Mickey and Oswald's next outing will be a multiplatform affair, Junction Point's getting some help. Via e-mail, Disney's confirmed that Junction Point will be leading development on Epic Mickey 2, working in conjunction with Blitz Games. Blitz's past includes the Puss in Boots, Michael Phelps: Push the Limit and Spongebob Squarepants: Surf and Skate Kinect games, as well as Yoostar 2 for for Xbox 360 and PS3. 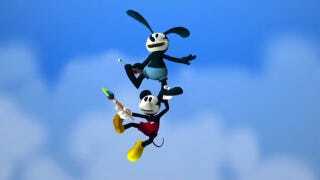 Disney Epic Mickey 2: The Power of Two is being developed much like a feature film with Blitz contributing to the development of the game for X360 and PS3. It's a full partnership between Junction Point and Blitz with one creative leadership team and one creative vision. Hey, as long as the camera's better than what we got in Epic Mickey 1, they can throw all the dev teams, they want on it.